A politburo (/ˈpɒlɪtbjʊəroʊ/) or political bureau is the executive committee for communist parties. 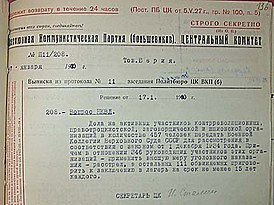 The term "politburo" in English comes from the Russian Politbyuro (Политбюро), itself a contraction of Politicheskoye Byuro (Политическое бюро, "Political Bureau"). The Spanish term Politburó is directly loaned from Russian, as is the German Politbüro. Chinese uses a calque (Chinese: 政治局; pinyin: Zhèngzhìjú), from which the Vietnamese (Bộ Chính trị), and Korean (정치국, 政治局 Jeongchiguk) terms derive. The first politburo was created in Russia by the Bolshevik Party in 1917 to provide strong and continuous leadership during the Russian Revolution occurring during the same year. The first Politburo had seven members: Lenin, Zinoviev, Kamenev, Trotsky, Stalin, Sokolnikov, and Bubnov. During the 20th century, nations that had a politburo included the USSR, East Germany, Afghanistan, Czechoslovakia and China, amongst others. Today, there are five countries that have a politburo system (which are also the only communist countries left), (China, North Korea, Laos, Vietnam, and Cuba). In Marxist-Leninist states, the party is seen as the vanguard of the people and from that legitimizes itself to lead the state. In that way, the party officials in the Politburo informally lead the state. Officially, the Party Congress elects a Central Committee which, in turn, elects the Politburo and General Secretary in a process termed democratic centralism. The Politburo was theoretically answerable to the Central Committee. Under Stalin this model was reversed, and it was the General Secretary who determined the composition of the Politburo and Central Committee. This tendency decreased to some extent after Stalin's death, though in practice the Politburo remained a self-perpetuating body whose decisions de facto had the force of law. In Trotskyist parties, the Politburo is a bureau of the Central Committee tasked with making day-to-day political decisions, which must later be ratified by the Central Committee. It is appointed by the Central Committee from among its members. The post of General Secretary carries far less weight in this model. See, for example, the Lanka Sama Samaja Party. ^ "Received 2012-02-02". Merriam-webster.com. 2012-08-31. Retrieved 2014-06-16. ^ "USSR: Communist Party: Politburo". Archontology.org. Retrieved 2014-06-16. ^ "Politburo (Soviet political body) – Encyclopædia Britannica". Britannica.com. 2013-04-24. Retrieved 2014-06-16. ^ "A List of Current Communist Countries". Geography.about.com. 2014-05-29. Retrieved 2014-06-16.